1. Which languages would you like us to translate from and into? 2. What is the nature of the document? 3. What do you need the translation for? We ask these questions for good reason, not out of curiosity. Question 1 is clear and you often give us this information from the outset in any case. But what is the point of the second and third questions? They enable us to classify your translation assignment correctly from the very first moment, so that we can handle it effectively. When you submit personal documents, such as a birth certificate, marriage certificate, character reference, criminal record, testimonial or visa application and attestation to an authority or a public office, a simple translation is not enough. You will need a certified translation. 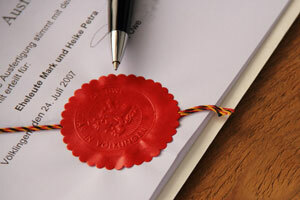 Translations of a company register extract or commercial register, court ruling or contract also have to be certified. A certified translation may only be made by a translator with the required accreditation from a recognised institution or court. The name used for such translators differs depending on location, e.g. in Austria they are known as sworn and court-certified translators, in Germany as sworn translators and in the UK as certified translators. In addition to completing their studies and after a long period of practical experience, translators are required to pass a rigorous examination at one of the above bodies. Only then do they have the authority to prepare a certified translation. Sworn or certified translators append to their translation a certification note in which they vouch for the fact that the translation conforms to the original document with their signature. The translator’s stamp or seal is adjacent to the date and her/his signature. The translated document is attached to the original, transcript or copy. Even though the certified translation is dated, it has perpetual validity. You only need to have a certified translation of the document prepared ONCE. This means that you should keep the translation just as safely as you would the original. What is the procedure for a certified translation? You can bring the documents to our office in person. You can post the documents to us – we recommend that you only post copies and NOT originals – or send them by registered mail. Upon receipt, we will contact you immediately by phone or email and give you our date of completion and the estimated cost. Certified translations are more expensive than other specialist translations. Because the certification fee per document (please note: not per page) has to be added. The net fee for certification is € 20. You can expect € 70 net per certificate/per page. And at this point we return to our initial question: What do you need the translation for? We should also know – not out of curiosity, of course – where the journey is headed. To an authority in Austria, Switzerland, Germany, England or Australia? This is because the type of certification differs depending on country of destination. In some cases, notarisation with apostille is also necessary. All your documents are in safe hands with eurolanguage. We vouch for this with our eurolanguage oath. Simply send us your request and we will send you a firm offer by return.